Trains Today: Is competition good for the South West Mainline? 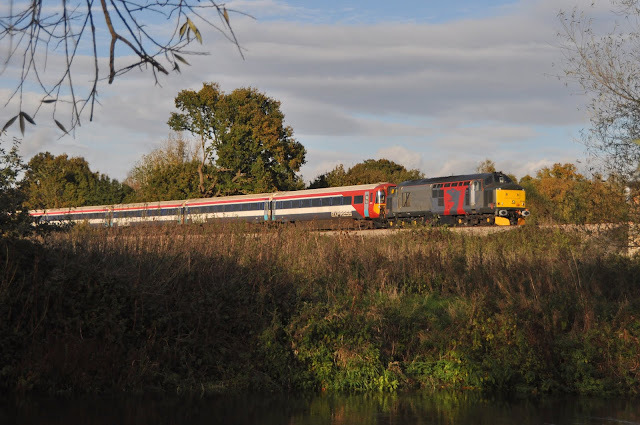 Last month Alliance Rail Holdings announced their intention to begin a new 'Open Access' service between London Waterloo and Southampton to compete with the franchised operator on the South West Main Line. The SWML is one of the busiest and most congested routes on the UK and a franchise which currently pays a significant premium to the UK Government. Alliance says that they are working with the industry to identify paths for seven off-peak journeys per day (with two peak services to follow in 2018 following work to increase capacity on the line) using class 442 'Wessex Elecric' 100mph EMU's. 37884 hauls 2411 from Three Bridges to Eastleigh on 11th November 2016 seen in the Addlestone area. The unit has come off lease with Southern/Gatwick Express, but could these fine trains return to the SWML with an 'open access' operator? Competition has undoubtedly brought more consumer choice on the East Coast Main Line where both First Hull Trains and Grand Central operate open access services, however it has also meant that the expansion of franchised services has been subdued and detracted revenue which would otherwise be received by the government in premium payments. Introducing more seating capacity on the SWML is certainly a good thing but whether this should be in the form of a competing operator I am not sure. Certainly I would be more than happy to see the 442's back on the Wessex patch where they belong, but I would first be interested to see what service enhancements are proposed in the two bids for the next franchise by Stagecoach and First/MTR. It is entirely possible that these bids may also have identified extra paths and stock to utilise them and this may give a better return for the taxpayer as well as giving more operational flexibility in not having another operator to deal with on the congested line into Waterloo. There is definitely a leisure market on this route and South West Trains have increasingly tapped into it with their promotional off-peak fares. Could Alliance Rail offer a better product? We will have to wait for the ORR to give their ruling on the proposal. Alliance hope to be running their off peak services from the December 2017 timetable change- their press release can be read here.